Warehouse, silo and public cold storage business are necessary to provide services to keep goodswith remuneration in the ordinary course of business in addition to has obligation to issue a warehouse receipt or marketing,financing instrument as desire by the depositor such as may endorse and consign of goods, use endorse pledge of goods as guarantee of borrowing e.g. (business has nature equivalence of pawn shop business or commercial bank). An engagement may affect to economy or happiness of related people so necessity has accepted law for regulation such business for fairness and reliability to related person including for giving information to the entrepreneur and for the interest to fix measurement or as a tool of public sector to solve on market problem. Admitted to keep of goods or proving of service related of goods for remuneration in the ordinary course of business either such remuneration will be cash or other interest. Consent to the depositor borrowing by pledge the goods as a guarantee to the entrepreneur of warehouse and the warehouse entrepreneur will obtain interest or other interest as remuneration. Any committed accordance custom clearance related customs, importing, exporting, carriage and may providing of goods insurance which can make a contract to storage of goods in the warehouse or rent the warehouse in partly by itself after has permitted from the General Director of department of Internal Trade. Warehouse, silo and cold storage is an obligation under law provide to the entrepreneur must request to permitted and comply with criteria and conditions for safeguard happiness of the people, in present have 3 laws to regulatory. Ministry of Commerce Notification on arranging of silo and cold storage business as a similar business of warehouse business and conditions to control such business B.E. 2535 (1992). As a source to assist farmers, suppliers, entrepreneurs, importers and exporters can bring of goods to storage for maintaining the quality pending to sale when obtaining appropriate price or bring to transform or export to abroad. 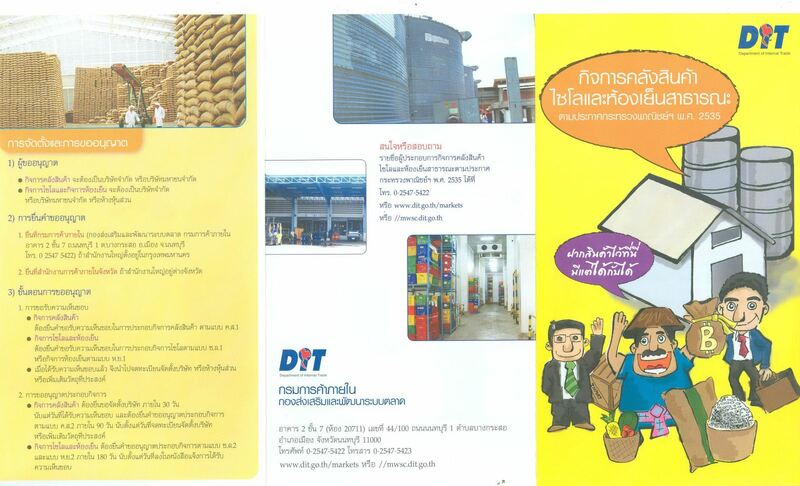 As a source to assist farmers, supplier, entrepreneur, importer and exporter can bring products or goods which storage to pledge to the warehouse, silo and cold storage which depository such products or goods for has revolving fund to carry out self- business or can ask for the warehouse receipt to endorse and pledge of goods as guarantee of borrowing with commercial bank or finance institution. As a source to assist consumers have a chance to consumption of goods throughout a year and goods price has stabilized to assist to economy security of the country. Warehouse business must be a company limited or a public company limited. Silo and cold storage business must be a company limited or a public company limited or a partnership limited. Filing at Department of Internal Trade (Promotion & Marketing Division, Department of Internal Trade, Building 2, 7th floor, Nonthburi 1 Road, Bangkasor sub-district, Muang District, Nonthburi Province, Tel. 02547-5422) if has the head office situated in Bangkok. Filing at Provincial Internal Trade Office if has the head office situated in provincial. Warehouse businesses must filing to approval to engagement of warehouse business according form Kor.Sor 1. Silo and cold storage business must filing to approval to engagement of silo business according form Sor.Lor. 1. Or cold storage business according form Hor.Yor. 1. When acquired approval then company or partnership registration or addition of objective. Warehouse business must filing to register of company within 30 days after the date of acquired approval and must filing to business engagement according form Kor.Sor 2. Within 90 days after the date register of company or addition of objective. 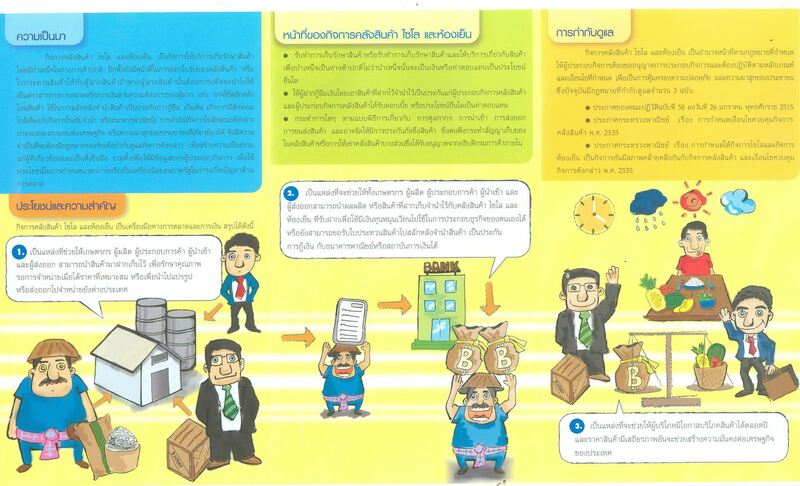 Silo and cold storage business must filing to business engagement according form Sor.Lor. 2. And form Hor.Yor 2. Within 180 days after the date specified in letter of approval.